One part mixtape, one part disorientation guide, and one part career retrospective, Kyle "Guante" Tran Myhre's debut looks you directly in the eye and doesn't let you flinch. Ranging from justice to love, community action to personal reflection, A Love Song, A Death Rattle, A Battle Cry is a dedication to craft. Clocking in before the rest of us are even awake, the book wastes no time. It does the work and beckons you to follow. 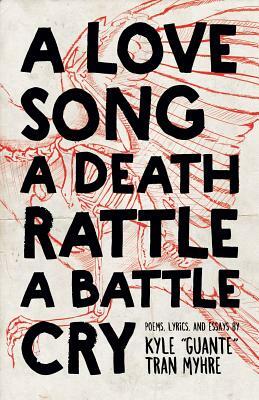 A compilation of poems, lyrics and essays from the UN presenter, MC, and two-time National Poetry Slam champion, this book is a love song tucked into a grenade, a necessary call that demands a response.